Guess what? The Steam Review is dead. I make this point in order to to ease myself into the second paragraph, where I link to Digital Distribution Review. It’s a relatively new site run by one ‘Kurina’, which since May has been posting the kind of erudite analysis I always strived toward for the same reasons I always identified with. I like it. It’s only fitting, of course, that a Digital Distribution Review should take over from The Steam Review. Steam is a long way from the only service on offer today, and although I tried to encompass other services on this site doing so never quite made sense beneath a green, white and black header. Don’t unsubscribe just yet however (there are still over 450 of you), as TSR isn’t going anywhere; depending on whether Kurina covers Blizzard’s reveal of the new Battle.net there may even be a new article coming up…maybe. See you around the SPUF and I’ll look forward to that possible article that may or may not be appearing in an undefined period of time in the future! While it’s true that there are other distribution platforms (Impulse, EA Store, Windows Marketplace…), I don’t want to read about those. I want to read about Steam because it is my favorite digital distribution service. i’ve been patiently wishing you’d start up again. I’m with Joest. I don’t mind hearing about other distribution platforms, but I’m not really that interested in something that I don’t actually use. 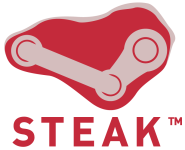 I use Steam. What I liked about The Steam Review is that it gave a distinctly outsider view of the whole system.